Enjoy this Italian chopped salad with your favorite meal. I love adding cannelloni beans but you can omit them if you follow the Paleo Diet. I have added the recipe below for the fresh parmesan crisps! You may want to hide them before they are gone.. In a small bowl whisk together the shallot, red wine vinegar, dijon mustard, salt, and pepper. Continue to whisk while adding the oil to blend. 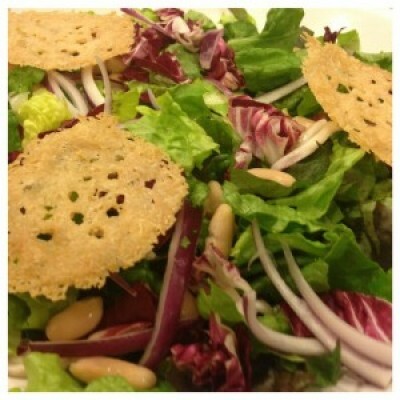 In your salad bowl add the lettuce, radicchio, red onion, beans, and sun-dried tomatoes. Line your baking sheet with parchment paper or silicone. Add 6 mounds of grated cheese keeping about 1/2 inch apart. Bake for about 4-6 minutes. Cool for 2 minutes, remove and set aside until ready to use.